Here’s another set of wireless and sweatproof earbuds that will get you through your workout without being connected to your device. The Plantronics BackBeat FIT 300 are one of the Plantronics products we’ve received to review recently. We have reviewed some other Plantronics items in the past, including another BackBeat wireless earbuds set, but here goes our first review of these earbuds. The earbuds are the expected item in the box, of course. There is a small box on the right side with battery and relief buttons that adjust volume, manage tracks, and houses the mic and battery. Also included is the micro USB charging cable, and various eartips to help you get the right fit for your ear. If you get the 305s, it comes with a mesh carrying bag. I’m not sure exactly what the difference is. They are the same price. The silicone tips on these earbuds are oval shaped, which is different from what one might see on most earbuds these days. The shape fits snugly in the ear to provide noise isolation. The threaded cord helps to prevent the cord from tangling up in itself. There is a promised battery life of up to 6 hours, and although we’ve seen better, it’s still a decent amount of battery life for a workout. There is a deep sleep mode that will save the battery life for up to six months, so you won’t have to worry about recharging again if you haven’t used it for a while. 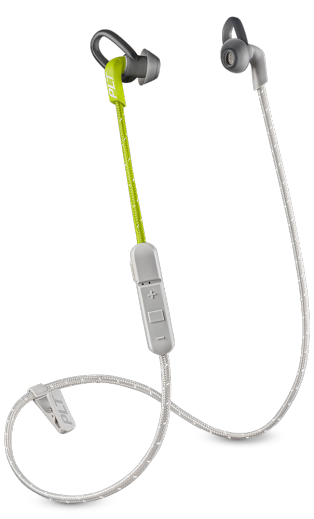 The loops on the tips hold the earbuds snugly into your ears, so you can sweat and shake around, and they won’t budge. They are also lightweight at 14 grams, although the inline mic/controller might be a little bulky. It’s probably similar to other wireless earbuds like these. The sound on these earbuds are pretty great, and worth the $80 price tag. We received the lime green color ones to review, but these earbuds also come in dark blue, black and coral color options. They all cost the same, and as mentioned before, the 305 ones come in the same color, but with a bag. I’m not sure of the difference in quality. You can buy a pair on the Plantronics website, or shop around on-line. Disclaimer- Plantronics sent us this model for free in exchange for an honest and unbiased review. No other compensation has been provided.